Nigeria, the home of some 120 million inhabitants and to some of the world's greatest "footballers," has produced some strong chess players as well. The Nigerian Chess Federation is only 27 years old and has faced many challenges, but there are high hopes placed on the shoulders of the nation's brightest stars. IM Oladapo Adu is one of them. Hailing from the nation's most populous city of Lagos, Adu rose quickly through the ranks to become one of Nigeria's top players and has represented the country in two Olympiads. Adu, now residing in Maryland (USA), is known for his blitz prowess and has been a visible player in most of America's major tournaments. If you see him, challenge him in a game of basketball and see what he'll say!! Oladapo's story began with a familiar tone… learning chess from a relative and then branching out for serious competition outside the neighborhood. He describes his rise this way: "I was taught playing chess by my brother (Olubunmi Adu) in 1987, and it was always very hard defeating him. It took me a year to be able to win a game off him, and when I did win one, I went on to defeat the other players in my neighborhood. From then on, I had this strong thirst to defeat anyone I played, and my quest for stronger opposition had me visiting the colleges & universities in Nigeria to play chess. After a series of victories, I met my stiffest opposition in University of Lagos (Lagos state), and this was where I knew there was something like a chess tournament. My rise in chess in Nigeria was so sudden that, all of a sudden people started seeing me as a promising player. After playing 3 chess tournaments, I suddenly found myself becoming a master in less than 2 yrs." His chess career would then skyrocket when he won a gold medal for his university and a number of other tournaments. "In 1994, I had a big break by winning the Olympiad chess trials with a score of 11.5/14 (seeded 15th in the trials); tied in second position was IM Odion Aikhoje, IM Fola Akintola, NM Tolani Owosina, NM Okechukwu Iwu, with 9.5/14 points." With this victory, Adu earned a chance to represent Nigeria at the 31st chess Olympiad in Moscow. Adu has fond memories of the event and remembers meeting GMs Garry Kasparov and Vladimir Kramnik. "Our team was well taken care of… most especially with the influence of Garry Kasparov, who took a group picture with our team and also gave us a very warm welcome," Adu remembered. He was also distracted by the sight-seeing and being around the world's elite and scored sub-par 3½-4½. In 1995, Adu continued his rise and became Nigerian national champion. In 1996, he affirmed his position by winning nearly every major tournament in Nigeria, and again qualified in a trials to represent Nigeria at the World chess Olympiad in Armenia. Unfortunately, Nigeria would not compete for lack of resources. So in his disappointment, Adu took a break from chess. 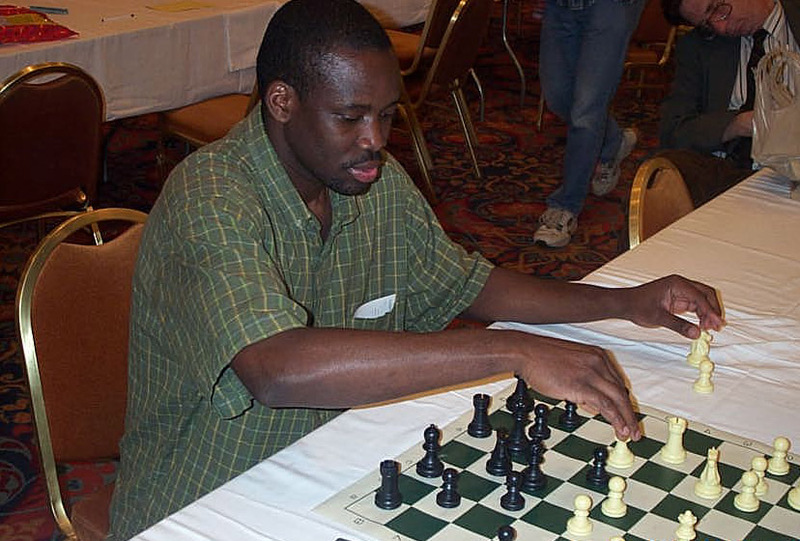 In July 1997, Adu came roaring back out of "retirement" and represented Nigeria at the 2nd African Team Chess Championship in Cairo, Egypt. He won a silver medal in that tournament, and the next year he would find himself (with five others) representing Nigeria once again the World Chess Olympiad in Kalmykia Republic, Elista. Nigeria gained notoriety when IM Aikhoje Odion won a gold medal on 2nd board ahead players like GMs Vassily Ivanchuk, Smbat Lputian, and Kiril Georgiev. Adu scored 4½-4½. During the Olympiad, Adu has fond memories of discussions with other African players. "At the Olympiad, myself Watu Kobese, and Pedro Aderito (Angola) often discussed and debated amongst ourselves who the first African GM was going to be, and before anyone could blink, GM Maurice Ashley got the spot. At events like this we all come together and discuss on how to improve our games, and how to rise to the top. Watu Kobese has always been of great help to everyone because of his experience and also his strength." After the Olympiad, came perhaps his stiffest individual challenge. "I was invited to the First African individual chess championship in Egypt. This was a good event for me because I defeated a few IMs, and stopped the winning streak of 5 games in a row (in a 9-round tournament) of the South African, IM Watu Kobese (2425 ELO). I finished the tournament with 6/9 (an IM norm) and tied for 3rd position with Watu Kobese, who is a good friend of mine, and also, a chess helper. The winners of the event were IM Ibrahim Labib (Egypt) and IM Mohammed Tissir (Morocco) who got an IM title after the event. Two weeks after the African individual chess championship, myself and Odion Aikhoje took part in the Zonal world chess championship event in Tanta, Egypt. I scored 6/9 points, while Aikhoje scored 6½/9 points and this was good enough to give us each an IM title." Adu has been in the United States for the past few years, and has found adjusting to the new environment a challenge. "Back home I used to study for about 4-5 hours a day, but since I have been in the United states… well things have changed. My play has dropped… too many distractions… so many things to do. I rarely study for an hour straight without diversions." However, Adu is planning a disciplined regiment to play himself back into top form. As of late he has scored victories over GM Alexander Ivanov (2655) and Kriventsov Stanislav (2417). His first book was Complete Chess Strategy by the legendary writer, Ludek Pachman. Currently, he studies his opening repertoire extensively by using materials such as the Chess Informant. He plays the dreaded French Defense!! What does this Nigeria chess master like to do outside of chess?? "I love to play basketball, and was on my college team back in Nigeria… that is my number one sport," claims Adu. Despite Nigeria's affection for football (soccer), chess remains #2. In addition, "Dapo" loves to work with kids and when he has spare time, enjoys Discovery channel, TLC and documentaries. Lastly, if you ever need a tournament traveling partner, he also enjoys driving! !